Is it just me or is 2016 going by extra fast these days? I've been MIA on my blog the past month because I've been extremely busy with work once again and also, my mind has been so preoccupied with another thing (more on that later). Now let me get the ball rolling again as in a month's time, the first quarter of the year will come to a close (insane!) I've got so much to blog about especially films that I've been dying to see since last year (mostly the Oscar-nominated ones), more food trips with friends and all the things in between. Hopefully, I get to post about everything in the following weeks! 1. I've participated in my first ever Zomato #FoodieMeetup! I've gotten invites for this before but my schedule just won't allow me to attend -- either that or it gets cancelled. Luckily, this meetup was in Charlie's Grind & Grill in Kapitolyo so I was able to make it (though I was still caught in heavy traffic). 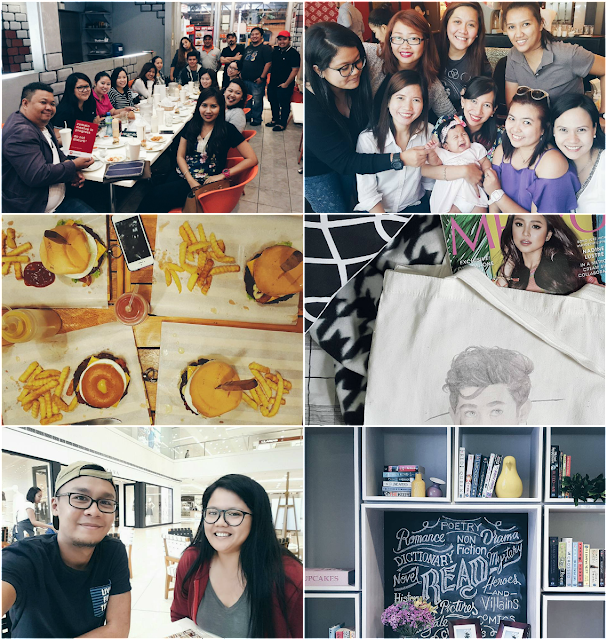 I had so much fun meeting the peeps from Zomato as well as other food bloggers like KC of What the F! and Michy of I am Dekaphobic. Also saw Ms. Joy of Gastronomy by Joy there! Good times! 4. The other thing I got so caught up with? JaDine. Hahaha. I'm just going to lay it out there. Last year, I think, I was still at the "fangirl lite" stage. You know, I got so out of breath when I unexpectedly met James Reid for the first time, got to pose a photo with him and even touch him and talk to him (LOL I sound creepy, I know) but this month, I think I went a little bananas over this local loveteam. I am the merchansdise-buying, pay-per-view-availing, giddy for updates, scream-at-the-top-of-my-lungs-when-my-OTP-turned-real kind of fan. I may be on the high end of the spectrum of this scale. And I honestly think this isn't going to be over any time soon. Hahaha! 5. Middle of the week catch-up with one of my favorite people, Ian! It's been quite a while since we last saw each other and hung out! We had lunch at Chelsea Kitchen, which, by the way, serves amazing three cheese stone-fired pizza. And I absolutely love their donut holes! 6. Before the month wrapped up, I was able to go to Book and Borders Cafe's second branch grand opening in Tuscany Estates in McKinley Hill. I'm really impressed by the selection of books they have. While waiting for the event to start, I was able to pick up a copy of Norwegian Wood and read its first few pages. They also have Palahniuks! I've also sampled their newest and latest offerings: an aligue seafood pasta and turmeric raspberry drink! Sounds interesting, no? I will be writing about it for Urban Tribe, hopefully get to finish it before the week ends. There you have it. My life has been pretty exciting so far and I am not complaining--not one bit. It's already March, and I couldn't be more excited because WANDERLAND MUSIC FEST THIS WEEKEND! So darn excited for Panama, Bon Iver and Death Cab for Cutie! Will I see any of you there? WOOHOO!